Gregory Dunne: I understand that you are bringing out the final two volumes of Cid Corman’s Magnum Opus of? When will they be published? Bob Arnold: As of today, January 26, 2015 (the day of a Nor’easter blizzard), of is announced and out and already circulating with a reading audience that has been waiting. It feels very good to finally have the big book in hand. Dunne: How will they be distributed? Arnold: The book will be distributed from Longhouse — in house and humble, much the same way Cid distributed Origin publications straight from his own quarters, whether he was in Boston, or Kyoto, Japan. This is way we’ve been moving our publications for forty years. Dunne: When were the earlier volumes published? Arnold: of volumes 1 and 2 were published by Lapis Press in 1990. Volume 3, Cid took care of from Origin in 1998. Dunne: Who is publishing and printing the book? Is there any special reason you chose this printer? Arnold: We’re publishing of at Longhouse. Thomson-Shore takes care of all the books we publish. The special reason is that they get the job done with quality. None of our printing is POD — we start in small increments and build up. Dunne: How many pages do each of the volumes contain? Arnold: The first three volumes came in at approximately 750 pages each. I edited and designed volumes 4 and 5 (the final work) into one book at a little under 850 pages. If we could have afforded to, we would have also seen two volumes at 750 pages. Two books for each volume seemed unnecessary and extravagant in these times of an unpredictable readership, storage, expense, and we liked the idea of two books socked together. It holds. Dunne: How much editing did you have to do on the latest volumes? Could you speak on the challenges of that? Did you find yourself struggling with decisions as to which poems to include and which not to include? What guided you in those types of decisions? Arnold: A little background here might be appropriate. Cid, of course, was the longtime editor of Origin, and I am the editor at Longhouse, and in 1974 we joined up via a correspondence that took off. We came together through a mutual love for books, outcasts, publishing small press journals, and poetry. We were also working on the outer edges of recognition. Despite the fact of who Cid had published, by 1974, over a quarter-century — from Olson to Zukofsky, Bronk and Levertov, Creeley, Niedecker, Enslin, Samperi, international poets, etc., his own poetry and translations were living in the upper echelon of the smaller publishers: from New Directions, the Elizabeth Press, and his own Origin. He was a homemade pie, a homemade apron, a homemade entity, packed with a dynamo and reflexed intelligence. It was actually his strength and independence. He saw a similar driving wheel in me and I was coming to him as a very young poet and editor with a mimeograph magazine, “in a cabin, in the woods, a little old man (boy) by the window stood.” Cid would admit to me ten years later that for those first many years, he thought we were the same age and I must be his contemporary! That was always the charm of Cid — he didn’t care who you were, what you were, and what any of it was about; he just wanted to sense and feel the heat of poetry was involved. We immediately dug into what he was publishing and wanting and what I was publishing, and without batting an eyelash he sent me a group of his poems. Do with them as I wished. He trusted. What a marvel! So right out of the gate I was reading his poems (and had been since 1969), and we were in a conversation about his poems, others’ poems, what I was publishing, and eventually I got my own poems into his hands. He could be a brutal critic, many have whimpered and complained, but this didn’t last very long and it was all part of his getting adjusted, making his mark and setting up a code of behavior. There was a certain ethical and working-class hands-onto-the-poem craft that Cid lived by, and he quickly saw we were simpatico. And where we weren’t, and he adored opposites and differences that moved in positive ways, we could learn from one another. Now jump forty years later, after a thirty-year relationship with Cid that took place each week writing and receiving from one another three to four letters each week between us, and we would meet only three times in our lives face to face: in Bennington, Vermont, in 1980, in New York City in 1990, and in Milwaukee in 2003, each visit grand and intense adventures, where I always had Susan with me, and Cid’s letters forever included Susan, and our son Carson, so it was always a family affair. By the way, Cid only met Lorine Niedecker once. It’s simply marvelous what we could do together by letter writing, and this was in full evidence between Cid and Niedecker. By the time I have the loose notebooks of of volumes 4 and 5 before me, I’m looking at the poetry that had already been sifted and strained and panned for its gold all through our correspondence. The letters and the poems and Cid’s life were all one. The entire time he was writing all five volumes to of he was sharing the experience in the letters with me and certainly to others. So when I have the notebooks to the complete of, I’m meeting the countryside he had been all this time describing. Here we were. Bob Arnold (photo by Susan Arnold). To begin with, Cid’s self-editing is impeccable. He knows what he wants. The only damage, such as it was, would be in the last two volumes where his health was fading and his prospects of having the last two volumes published was not showing forth, and he was still tinkering away at the notebooks. Corrections and squiggles had to be deciphered and decided upon. None of the pages were numbered, they didn’t have to be, since the texture and pattern of the poems stitched one to the next. Just pay attention, trust yourself and trust Cid. Get away from time to time from the poetry doctrine and listen to the outdoors, the trail, the seasonal, and detect how these volumes all do the same. The observant eye will sense this as the reader goes along in this new big book. I may have axed out a half-dozen poems, at the most, from 1,500 poems, due to them being unfinished, shaky, and unsure. The rest of the time I was looking at work and territory I had been told about as if from storytelling. Cid wasn’t pointing specifically at of every time in the letters, but he was. He was also sharing with me portions of the big work that I elected to design and publish over years and years as small booklets from Longhouse. I was well warmed up by the time the complete notebooks of the books reached me. Remember, we’re talking about 1,500 poems or better in this last book holding both volumes 4 and 5. Emily Dickinson’s complete poetry comes to 1,800 poems. The whole of of is double that. If there is anyone matching Dickinson’s oeuvre right out of New England, or anywhere else for that matter, it’s Cid Corman in the complete of. Dunne: In your estimation, how important is it that these volumes be published? Arnold: For Cid’s literary history, the long-work tradition, poetry from an American expatriate (home life for all of of’s creation is Japan), and the big book completed extravaganza, it’s essential. Unavoidable. Ignore the volumes at your own peril. It’s been places where you’ve been, it’s been places where you haven’t been, may never be, it’s our good fortune to be aboard. The volumes encompass both a poet’s worksheets and underbelly within the confidence of a polished work. It truly hums. It might scare you. Dunne: I once asked Cid about volume 3. I hadn’t read that volume — it was on its way into the world. I asked him how it contributed to the overall sweep of the work. He told me that it was “central,” and then he went on to explain to me why it was so central. He said it would — would give me “the scale of the whole thing,” that it was “autobiography actually, all poetry,” about his life before he began writing poetry. I was wondering how you see volumes 4 and 5 fitting in with the earlier volumes? In other words, how do you see volumes 4 and 5 contributing to the whole of the work? What do we get there that we don’t get earlier? Arnold: There is nothing earlier and later in of. It’s one whole. That’s its magnitude and strength. When Cid was alive and actively the maker he could speak to a duration of time and stages and what may be “central.” He was in the matrix. He was learning, prodding, even improvisational as he was going. He knew what he wanted and he went for it, but his poetry has always had the outstanding quality at being transparent while searching and so being right with the reader as the reader was in the midst. Cid’s present. He means to be. Often he is talking right at the reader, asking us questions, his own questions. There isn’t a frame. He’s breaking frames. If he were alive today my bet would be he would speak at this point as volumes 4 or 5 were “the core,” or the closure to the central. Each volume as he worked — and this was a man who never had a child — each book was his child. The book he was hip-deep in love with was the one he was working on. By the time the reader is within volumes 4 and 5 there is no mistaking the connective threads back through each previous volume. He continues to penetrate as he goes without losing his grip. There are myriad voices and musics. They’ve always been there shimmering the edges, but with the last volumes he reveals the mysteries. The concentration is riveting and relaxed. You’re in the hands of a master — just don’t swell his head by telling him. We can now. Dunne: What surprised or delighted you as you read through these volumes and began to ready them for publication? Arnold: Cid has the delight ready for the reader and it comes through as sunlight past the curtains in the Valery quote he uses: “The diamond of sincerity.” This is the hallmark of the last two volumes — sincerity — and Cid steers this imaginative machine by way of a ton of other authors’ works and translations that all come unaccounted for — at great gripes from his critics — watching Cid sculpt and form and pay homage to the many Grand Works he borrows from and in this case frames into poems of his making, so we receive a tremendous anthology of works, all as poetry, mined with his own poems. A Corman Reader. Every sized poem imaginable. He’s doing as he pleases, and he’s pleasing. Again, it is all one. The poet here is showing us his education, and it’s vast: from the cinema, baseball, sumo, literature, television, the street, media, politics, history, philosophy, psychology, other poets left and right of him, music, utterings, animal life, mystical life, no life, noh. You had best be ready. In these last two volumes there is a porthole to an animated and spirited world, much like the ancient sutras, which this transplanted soul of the Far East was well acquainted with. As in the ancient sutra caves where one shouldn’t focus on individual murals and isolated creations only, it’s all the same in Cid’s case, where one must see the entire body of pictures and poems, translations, private readings, borrowings, and all the homages (prayers) — this visual mapping of the Corman world. This is the seasoned and maturing and in fact true living/dying (Cid will pass) history and backbone of the Corman imagination. Instead of pouring everything right out of the gate in of volumes 1 and 2, we now see that we have a woodworker knowing his tree, his wood, grain, and tools, and he has always planned to build a ship, stem to stern. Dunne: That is a wonderfully rich background on your relationship with Cid. Thank you for that. It helps a great deal in understanding the relationship that you two shared and what you bring to the task of editing these volumes. Can I press a little further on your editing work in order to clarify? When you received volumes 4 and 5 in draft, what state were the volumes in? You felt a need to remove a few poems out of the 1,500 because they were “unfinished, shaky, and unsure”? What about the arrangement of the poems? Did you have to rearrange the sequencing of the poems or had Cid sent that in place prior to his passing? Arnold: “Unfinished, shaky, and unsure” meaning — Cid was rarely any of these when it came to his poems. Most often they were set in place square and tight, maybe like a stone mason himself with poems. So when I did come across any of the poems (and there were very few) that were unfinished, incomplete, hopeless to decipher since Cid was in a tangle himself with the delivery and the poem was obviously not addressed and finished, I set that poem aside. Knowing him well enough in our past together and what other work we developed as mutual editors, I had confidence he would agree. The notebooks came to me in looseleaf binders, neat, no pagination, but again, I knew the mapping Cid wanted as soon as I dug in and started to read. I was reading both a finished manuscript as Cid wanted, plus running across an interesting open-thought process Cid had kept in place that showed some of his notes about individual poems, and remember he is using a wide range of other poets and translators in the full batter of the manuscript. One minute you’re with Corman, the next you’re with Emerson, Dickinson, Chaucer, Valery, Issa, then back to Cid — and much of it undocumented. A quilt. Crazy quilt. A knowing quilt. I not only didn’t touch the arrangement, I kept as much of it in the finished two volumes as possible just as I found it. It was the last of Cid, the final notebooks he worked in. I’ll elaborate on this as we go along. Dunne: You have mentioned, “the notebooks to the complete of.” They sound fascinating. Could you describe them a little more? What do they look like physically, and what do they contain? Arnold: First off, Longhouse released the two volumes of of in one big book. The reaction has been exciting. Some readers believe they are looking at typos in some of the poems, but there aren’t “typos” in the book or any “mistakes” or even “mishaps,” the word I have even used. The book is Cid’s notebooks as I found them and shaped them for publication, not wanting to touch a hair of the natural ingredient. So I didn’t. Where he had duplicate poems (very few), I kept them. Where one long poem gets divided in this book between a few other pages, the reader gets that, too. The entire stack of loose-bound notebooks were, like I said, not paginated. Where a word suddenly doesn’t make any sense, right: be as confused for a moment as Cid. Where a “hut” should be “but,” blame the smear of his typewriter key. Where a word like “both” may be floating there as not at all making sense, in the notebook it probably did to Cid: “both” perhaps meant as a note to himself he wanted to use “both” poems? Or quotes he worked into place in the finished of. It comes with the tour de force. I wanted the whole of Cid, no sanding and preening, but the raw maximus, to come with this edition. How can anything be a bother or in the way from a poet working over his saw horses such as Cid did? Only fifty books were made in the first edition of this fullest notebook/finished quality. Since that first printing, Susan and I have already been adjusting things, along with the very generous John Phillips, a close reader of Cid as well, who has been kindly taking a great deal of time to read throughout the almost 850 pages of this Cid forest. It’s a team effort. Again, all Cid. He loved his poetry families. Dunne: Do these volumes include any new poems? Arnold: For heaven’s sake, both these volumes, and the other three volumes in the set, are all new poems! To correct a misnomer — of isn’t a “selected poems” of Cid’s — it’s all new work written over two decades. But that doesn’t mean you won’t find him slipping in, as he wishes, from his cabinetry and drawers. Clever fellow. Dunne: Yes. But “by slipping in” from the “cabinetry and drawers,” don’t you imply that on occasion, at particular moments, he may use a poem, or a translation, that he may have previously published? Arnold: For sure. That’s Cid’s ways and means — and in fact his playfulness to do as he pleases, with due diligence, not ego. He’s already formed this immense study of his own poems, along with dozens and dozens of other writers and poets down through the ages into all five of these volumes, but it is most pronounced in volumes 4 and 5; and by the way, Cid has taken it upon himself to form the other writers, say Bonhoeffer or Lewis and Clark, Vallejo, into his own shape and style. There is a great deal of old hipness and be-bop about Cid, improvisational skill and devil-may-care at creating a total reading — both his influences and his influence are in evidence. The heady influence from Ezra Pound’s Cantos is inescapable here, or what he learned working through the passages of Williams’s Paterson, Zukofsky and the barnyard of A. So while we may find a standard Basho and Sengai poem translation of Cid’s — and what is “standard” in Cid’s hands remains fresh — or one of his familiar poems, the overall reading of the huge set reads new, surprising, the combined poet and legendary editor up to his fullest potential. We are receiving the poet Corman and the editor of Origin at once, in full blast, and it’s relentless. Cid’s skill is also knowing these are books, a reader may take their time at how he has shaped the surroundings — hike his trails and go at their own speed, their own medium, volume to volume to volume looking around, soaking in. He’s been very careful at playing his hand while inviting us in. He’s always been a generous host. Dunne: How difficult has it been for you and Susan personally to edit and publish these volumes? What was the greatest obstacle for you in bringing these volumes out? Arnold: As we worked through this geography and mapping of the notebooks I started to see anodyssey of wanting to pay attention to the original as a found art piece. All the found pauses, fragments, spastic spacing at times, no spacing, titles crowded, some titles being the first line of a poem — all Cid’s. Even the blurt of a lonesome “1” just standing there naked and stupid and unwanted, hit by Cid’s typewriter key. Left by him for later, kept in the pages of the published book. Part of the mixup and mash of Cid organizing his notebooks, making his poems, gel gel gel. And to be clear — I didn’t simply lump the notebooks into a digital package and print. It took a solid year of deciphering Cid’s handwritten notes, changes, alternations, and since he showed he wanted those to be included, I put them in for him. But I didn’t touch the smell or the lay of the book because I wanted as-found-Cid to be there for this initial edition. A great deal of the book was mastering a design for all the poems and the hulk of the poet’s identity. It was to be spare elegance. Like a footbridge, like a wheelbarrow, like a bucket in the rain. I always work with my hands directly to the paper, like tools, old fashioned, that won’t change, and I would work all my own notes and design schemes toward Susan who would set all of this blueprint of mine onto digital transfer so we’d have it properly set up for the printer. The only obstacle at bringing the books out was funds. We had none, but we had the desire and labor in us — so I went about on a short campaign canvassing a few of Cid’s heavy-hitter supporters, true diehards, each a poet, and asked just enough to get this first edition printed in the fifty initial copies. Not a penny more. I begged low, and I hate to beg, Cid was better at it. It worked splendidly. Dunne: Do you have any regrets? Anything that you would have liked to have done with the volumes that you were not able to do? Arnold: Not a thing. It’s like the desert warriors and desert fathers say in the film Lawrence of Arabia. “It is written.” After two sets of the first three volumes were presented in black slipcase and costing dearly to print — fabulous editions all around — I wanted to make a reverse on the definitive black color scheme by changing to a white volume, with matte cover, as stout and the same size precisely as the other three volumes, along with Cid’s photograph on the spine. If Cid had a pen handy he would sign most anything with his name so that’s his first name etched over the photograph on the spine of the book. Fit together the finished books make an impressive set, I think. Dunne: When Cid asked you to be his executor was there any requests that he asked of you? Why do you suppose he asked you to be his executor? Why did you accept? What responsibilities do you feel in this role? How many Cid Corman books do you keep in stock? 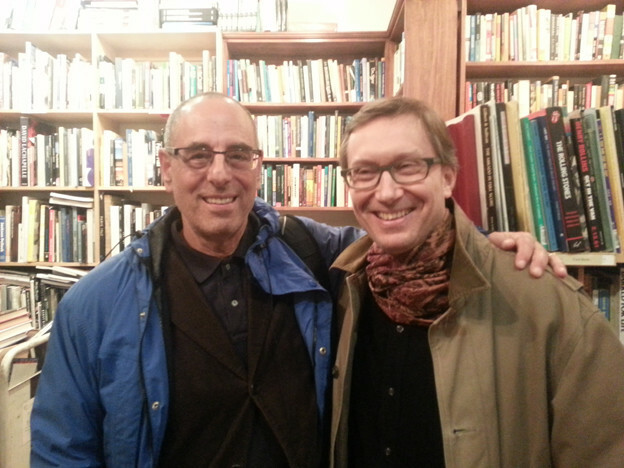 Arnold: Long ago David Wilk from Inland Books — a heartfelt distribution center for poetry and many other great titles of once upon a time (now defunct), brought up from Connecticut to us in Vermont a funky old van filled to the brim with Cid’s books. Hundreds and hundreds. They weren’t selling there, and I guess David’s business was breaking up and Cid needed a place for his poetry household to go. He told David to bring them to me. David can maybe tell you what Cid told him as to why he chose Bob. David has the secrets, not me! I don’t have a number answer to how many books of Cid’s we keep in stock, but it may be the most extensive on the market. My executor role just slipped into place as Cid, and I worked over the decades and then his wife Shizumi approved and moved it to my benefit after Cid’s passing. There was no thought to not accepting the position; I was already there. My role as executor is to guide the household, welcome suitors, do my best at seeing things are carried out properly and fair. Whether Cid’s work, or Lorine Niedecker’s, which came along with Cid’s. I also feel a strong obligation to publish their work where I can, and often, sometimes through Longhouse, or another press calling. Obviously I want to keep the work available and at the same time sheltered from misuse. Dunne: In addition to being an editor, a publisher, a bookseller, a stonemason, and the executor of the Cid Corman estate, you are a poet in your own right. 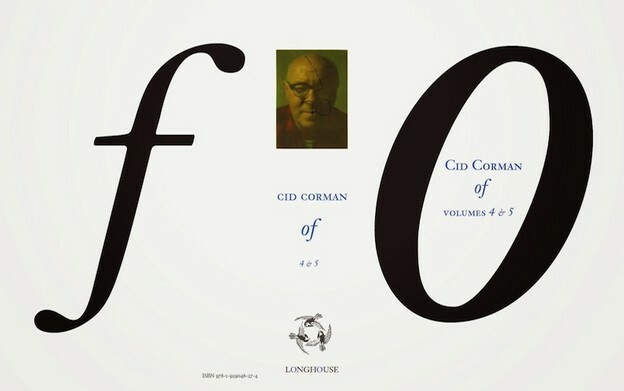 In the context of your own vocation as a poet, how crucial a figure would you say Cid Corman has been to you? Arnold: As a young poet, and as a young editor and publisher, since I started in on both at the same time, I already had my sights on particular poets who were zenith editors and certainly Cid Corman was at the top of the pile with his books of poems stemming from his own press at Origin and his two mainstay books at the time Living/Dying and Sun Rock Man both from New Directions. As a teenager in high school holding these books, and knowing there was a Cid Corman somewhere out there, made my head reel. You have to understand how important, in fact essential, coming to these poets and their books was for a young writer like myself stuck away in the hinterlands. I’d never been into any city. So the writers weren’t abstract to me, nor were their books, it was all food, nourishment, better than food. So by the time I met them personally I felt like I knew them, there was no hemming or hawing, we began. And this isn’t an exercise of name-dropping — I was in love. Cid was right there for me with Hayden Carruth, Donald Hall, James Koller, Walter Lowenfels, James Laughlin, James Weil, Jonathan Williams, Ian Hamilton Finlay as poets and gardeners of great small press journals, or magazines, books published — activists each and every one of them, really — and one way or another I sought them out, made contact, some became very good friends. Another editor/activist was Joy Walsh from the Kerouac newsletter Moody Street Irregulars; Joy was from a working-class neighborhood with high spirit and she was then in the early stages of evolving her Kerouac plan. In more ways than one, as a young reader, Cid’s translations took me by the hand into Far East. His own poems would match the masters. Now, young poet, set your own sights. Dunne: What might younger poets glean from such a book as of? Arnold: More than likely what is possible, and how nothing is impossible. The book is massive and yet still a book, fully a book; not a techno-trap, not a lot of poems spinning their wheels. Cid is building page by page like a carpenter proceeding with joinery — the handcrafting is wildly evident and yet Cid keeps it all clean, down to earth, spacious, mountainous. He’s the ultimate pencil pusher who had the eye and the grit to publish Gary Snyder’s first book, Riprap, homesteading Ted Enslin’s poetry (and fostering a lasting friendship), Vietnam veteran George Evans’s riveting poems, Vermont Lyle Glazier’s lyrical farm gems, and my stone building book On Stone. Young poets may see straight through Cid’s poems into this locus of substance and wonder. Dunne: After Cid’s passing some of his ashes were brought here to you. Could you explain how that came about? Arnold: From what I understand someone snitched a cigarette-size packet of Cid’s ashes at the crematorium memorial, and I don’t believe it was as snitchy as it was described to me since Shizumi knew it was taking place. The cigarette packet owner, an American friend living in Japan, brought the ashes to me this way when he visited with his family. This is a religious family, and we would all perform our own service to Cid in the glade of our Vermont woodlot where I have been cutting narrow roadways and far trails fetching firewood and stone for all these years, and up from one of those trails we all hiked one summer day to bring Cid’s ashes home to America onto a stone cairn I had built with the assistance of fellow travelers to the cairn. It started with Susan and me hiking the trail daily and on each hike lifting one or two stones off the trail where we hiked. We brought those stones to a summit spot and there started to lay up this cairn. After a year we had it built. We climbed to the spot year-round, every day. When I told my friend about the cairn that was made, and how it was made, I might have asked or he offered to bring some of Cid’s ashes to us. We would set the ashes during this private ceremony onto the cairn and leave them to let the rain and weather soak them in around the stone. The very same thing I did when I built Janine Pommy Vega’s much larger stone cairn in the same woodlot, but not as far away as Cid’s. Cid’s we climbed to and kept the trail open and brush cut and maintained for five years. You remember you visited and hiked up there with us when we were still maintaining the trail. After awhile something nudged me or said to me, but not with words, “enough on this trail … let it pass.” And we have. Watching the woodlands regain and leaf out and having the trail almost disappear (but I can find it) seems absolutely all of Cid. He’s up there. Dunne: How much will the new volumes cost? How can they be ordered? Arnold: The first edition of two volumes in one book is $50. As an excited reader said to me, “That’s only $25 per volume.” I guess so. The books can be ordered straight from us at Longhouse. We’re in the yellow pages. Interested parties can find us on the web — the new yellow pages — and order from our website. We like to keep it simple, charmed. Dunne: You have known of Cid’s work for forty years. You are intimate with his work and you knew the man better than anyone; how do you assess his legacy as a poet, or, if I were to ask the question as I imagine Cid would like to have me ask the question, how do you assess the work, is it work of lasting value and quality? If so, why do you think that is so? What is it about the work that makes it so? Arnold: I have no idea how a legacy is made, and I don’t want to know. Bad luck. From what I see and hear Cid has already entered legend. He was caterwauled by some of his own generation, praised by others, pissed on by even more, and rediscovered almost every ten years by one more younger generation sweep-of-the-hand who came to him with their poems, and often got creamed! And if they were still standing afterwards, many became lasting friends, some devotional. They’d visit his modest abode in Kyoto — from Ginsberg to some young wanderer — and Cid accepted them into his house each and all the same. If that isn’t legendary, I don’t know what is. As a mutual acquaintance of Cid’s once said to me, “His poems will last the next one thousand years.” At least. I agree with that, and I don’t want to know why that is so or even argue the point.I want to be reading Cid. I’ll wait for the boldest academics to assess his work, but I won’t be waiting for it, even though some of it will be important. I’ll like to be in the cellar of some floundering bookshop getting by on selling college text books and insisting on having used books down in that cellar, just out of old habit and not knowing yet how to destroy books, so they harbor them, in the thousands, and one lucky day I’ll be in there when a young reader, or old, comes across a copy of this black-and-white elegantly natured of and opens it up and starts to read. Then I get to see the expression on their face. You know, I woke up this morning thinking about how you have four children. I come from a family of four children. Cid came from a family of four children, and I met them all.